Medieval Iceland illustrates an actual and well-documented historical example of how a stateless legal order can work. Medieval Iceland illustrates an actual and well-documented historical example of how a stateless legal order can work and it provides insights as to how we might create a more just and efficient society today. Because of Iceland’s geographical location there was no threat of foreign invasion, so the demand for a national military force was absent. Icelandic settlers held similar ideological and philosophical ideas toward the state and the law as where held by the founding fathers of the United States, including distrust of a strong central government. The main reason the Vikings moved from Norway to Iceland in the first place was to avoid the feudal relationship between the king and his lords and serfs and thus the Icelandic settlers developed a decentralized system of governance. Iceland did not have an executive branch of government. Instead of a king they had local chieftains. One permanent official in their system was the “logsogumadr” or law-speaker. His duties included the memorization of laws, the provision of advice on legislative issues, and the recitation of all legislative acts one time while in office. Instead of a judicial branch of government there were private courts that were the responsibility of the godar. To solve disputes, members of this court system were chosen after the crime happened. The defendant and plaintiff each had the right to pick half the arbitrators. There was another level of courts called the Varthing. This was a Thing court in which the judges were chosen by the godar of the Thing. David Friedman has found that these courts were rarely used and not much is known about them. Then there was the National Assembly or the Althing. Each quarter was represented by their own Althing. If a dispute was not settled by the private courts, the dispute would go up the ladder to the next highest court until the dispute was resolved. There was no public property during the era of the Vikings in Iceland, all property was privately owned. The settlers of Iceland divided the country into 4 regions. Each region had 9 godord and the godord were divided into three things. The godord were divided into groups of three and each thing had three godord. The word ‘godord’ has two definitions. Godord represented a group of men. These men gave allegiance or alliance to a specific godi. A godi is the leader or chief who constructed a place of worship for his pagan followers. The godord was also a collection of rights, the right to represent the law making body of Iceland. David Friedman states, “…seats in the law-making body were quite literally for sale.” These men who were law-makers did not have power just because they held the title godord. They were powerless “unless he could convince some free-farmers to follow him.” This kept tyranny and injustice in check. Jesse Byock states in his book that, “leadership evolved in such a way that a chieftain’s power and the resources available to him were not derived from an exploitable realm.” This was because free farmers could change allegiance between godi without moving to a new geographical location. “The legal godi-thingman bond was created by a voluntary public contract.” The ability to switch legal systems with out moving, is key to a decentralized system. It creates secession down the level of the individual, making all governance structures formed truly voluntary. This unstable relationship between the godi and the thingmen in Iceland helped to keep government out of the lives of its citizens fairly effectively; law and arbitration were done justly. How were people held accountable if they did commit a crime? In much the same way as the current United States civil court system works today. Criminals were forced to pay fines. These fines did not go to the state, but were restitution. If the criminal could not pay the fine imposed on him, then he could go to his godord or a group of family and friends, or some other alliance, and have them pay the fine for him, or if no one would represent him, he could work the fine off via slavery. The poor were at no disadvantage. The poor could sell their right to justice to someone, such as a chieftain or another respected peer, who could collect or make right upon the victim. In this respect, the right to transfer restitution acted as an equalizer for the poor. In cases where the victim did not want restitution, the guilty parties had no obligations imposed on them. If a criminal would not pay his fine or submit to slavery, he was either outlawed or would possibly lose the support of his peers, depending on the severity of the crime, eventually discrediting himself. Even in times of war, it was understood that every man that was killed had to be paid for. This kept feuds short, there were never any real wars, and the violence could be classified as either a family feud or a battle. Battles were short and lasted a couple of days at most. Both parties always had the incentive to compromise and make amends because sustained violence is costly in this type of institutional framework. Iceland collapsed in the year 1262, 290 years after it was founded. Roderick Long points out that it only took 85 years for the United States to have its first civil war. That Iceland lasted so long is impressive. When one truly looks at Iceland’s history objectively, one can see what the real causes of Iceland’s collapse was. The lack of competition and the monopolistic qualities that eventually came about when five families cornered the chieftaincy market was one reason. These five families bought the majority of chieftaincies. They controlled the court and legal system to a significant extent. This meant that there were not as many chieftains to choose from. This led to less competition, creating opportunities for increased exploitation over the free farmers, eventually leading to a revolt against the 5 families. Roderick Long also addresses the fact that the introduction of the tithe in 1096 may have aided in the collapse of Iceland. The tithe was a tax paid for the upkeep of the Catholic Church and to pay church officials. The only stipulation was that the money appropriated to the upkeep of the church went to the private landowner (usually a chieftain). It is also no surprise that the chieftains were exempt from paying this property tax. Chieftains had expropriated earnings from free farmers and the free farmers had no way to keep the chieftains in check. What are the implications of the policies in Viking Age Iceland and how do we apply them to the modern world? Sure, after so much development in the last 700 years there could be difficulties in the simplicity of Iceland’s political system, but with great advances in technology there is also a greater potential for coordination in a more decentralized market system. The history of Viking Age Iceland has lessons to teach. One is the importance of a decentralized enforcement power. Iceland’s decentralized legal system managed to keep its leaders on a short leash for much of its history. Chieftains only had power if they could convince people to follow them, without the use of coercion. This minimized the principal-agent problem. Who wants to voluntarily follow an incompetent or evil leader? And even if an evil leader did sucker a few free farmers into following him, in the long run he would lose credibility. Another important lesson is to turn criminal into offenses civil offenses and make the victim’s claim transferable. The victim should have a transferable property right in restitution. This helps the poor protect their natural rights. It also helps to defeat the public good aspect of criminal enforcement, by giving the victim more of an incentive to bring the criminal to justice. In the public sector there is no economic indicator for success, but in the private sector firms have profit and loss accounting. Public law enforcement, assumes absolute protection. Police protection is not an infinite good that can be consumed to no upper limit. The government police system has a limited budget derived from limited taxpayer resources. Another reason private police agencies would be more effective is the fact that private firms want to maximize profit. How can a firm maximize profit without fulfilling the consumers’ demands? A government police agency gets its money coercively, so it does not have to satisfy citizen desires the same way. Any private firm that does not put profit as a top priority will be driven out of the market in the long run. Viking Age Iceland has much knowledge to offer on the privatization of law, courts, and enforcement agencies. The Icelandic Free State lasted longer than the United States has been in existence by 106 years. Iceland did not have a civil war in the first 300 years of its existence. It took only about 80 years for the United States to have its first civil war, and after the war, arguably was no longer the same system of government as it was before. David Friedman: Private Creation and Enforcement of Law: A Historical Case. 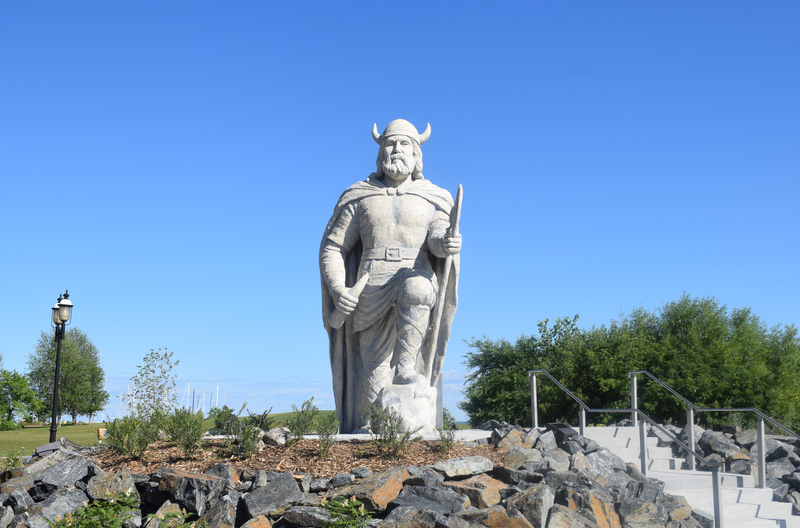 Long, Roderick: Privatization, Viking Style: Model or Misfortune?. Byock, Jesse: Viking Age Iceland p. 119. Friedman, David: Private Creation and Enforcement of Law: A Historical Case. Byock, Jesse: Viking Age Iceland. Murray N. Rothbard: For a New Liberty p. 220. Originally published by the Mises Institute under the terms of a Creative Commons license. This entry was posted in History, Iceland, Medieval, Middle Ages. Bookmark the permalink.